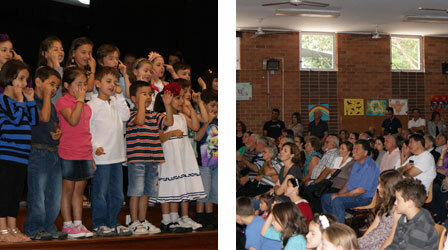 Hundreds of parents, guardians and grandparents attended the End-of-Year Celebrations at all locations of the Aristotelis Greek Language School to applaud students and teachers who worked hard to present excellent spectacles enriched by Christmas poems, carols and brief plays. Congratulations to all, especially to those students who made a special effort with the musical instruments especially Ms Patapis on the piano at the Manly location. 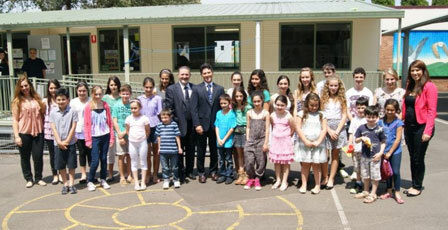 Another highlight for 2011 was the visit by the State Minister for Communities, Citizenship and Aboriginal Affairs, the Hon. Victor Dominello who was accompanied by the NSW Federation of Community Languages School President Mr. Albert Vella and Project Officer Mrs Eva Tzodouris at our West Ryde location. The students were very excited to display their works of art which impressed the Minister and the other guests. 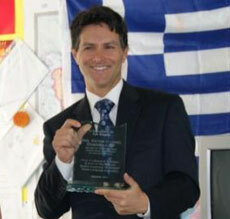 Minister Dominello was presented with a piece of art and a commemorative plaque by the President of Hellenic Centre that auspices “Aristotelis” Greek Language School, Ms Tanya Doulaveras.